Livingstone College is a four-year, private, coed, liberal arts college affiliated with the African …. Livingstone College is accredited by the Southern Association of Colleges and Schools to award the Bachelor of Arts, Bachelor of Science, and Master of Theology degrees. Percentage of students receiving financial aid: 96 Range of scholarships and grants: 0–00 Financial Aid Specific to the School Army ROTC: Offers two- and four-year scholarships that pay for tuition, fees, books, and other expenses, and provide a monthly stipend. Students should contact the ROTC Office. Athletic scholarships: Available to students participating in intercollegiate sports. Students should contact the Athletic Department. Graduation from an accredited high school (or equivalent) and completion of the following 16 units: 4 English, 3 math, 2 social studies, 1 science, and 5 electives; a high school GPA of 2.0 or better; a recent physical examination; academic status in top 60 percent of class; two letters of recommendation from high school; and a application fee with application. Admission Application Deadline: July 15 (fall). Admission Contact: Director of Admissions, Livingstone College, 701 West Monroe Street, Salisbury, North Carolina 28144; Telephone: 704-216-6001; 800-835-3435 (toll-free). 124 semester hours with 53 hours of core requirements, including 3 freshman English, 3 religion (Old and New Testament), 2 physical education, 8 natural science, 8 mathematics, 9 social science, 6 modern foreign language, and completion of freshman orientation. Campus Regulations: Must take 4 hours of religion, attend a weekly assembly, attend monthly vespers services, abide by curfews and quiet hours, and follow restricted dorm visitation periods. Seniors must live on campus; all dorm residents must purchase meal tickets. Campus Services: Health center, personal and psychological counseling, career planning and placement, tutoring, academic remediation, math and writing labs, campus transportation system, religious services. Cars permitted without restrictions. 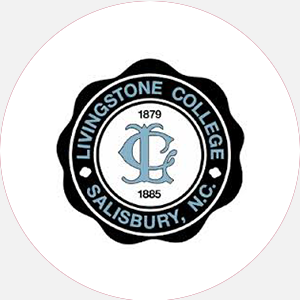 Campus Activities: Livingstone College offers an array of social and cultural activities for students, including a lecture series and concert series with renowned artists, as well as plays and dances. Students may get involved in the College’s marching band, concert band, choir, or the Julia B. Duncan Players drama group. Students may get involved in the writing and production of Livingstone’s many publications, including its annual publication (Arts Magazine), a literary magazine (The Bear’s Tale), a monthly publication (The Living Stone), or the college yearbook (The Livingstonian). Leadership opportunities can be found in student organizations such as the Student Life Committee. Greek sororities include Alpha Kappa Alpha, Delta Sigma Theta, Sigma Gamma Rho, and Zeta Phi Beta. Three national fraternities are also represented on campus. Honor societies include Alpha Kappa Mu, Beta Kappa Chi, and Psychological Honor Society. Students can choose to get involved in the monthly vesper services where prominent civic, religious, and student groups participate. Housing Availability: 650 spaces available; freshman housing guaranteed; seniors required to live on campus. Handicapped Services: Special class scheduling and special parking privileges.